Delhi Triple Murder: Muslim Neighbour attacks a Hindu family with a sharp knife, kills woman and her husband and son. Keep alert on Muslim Neighbor and think the way to survive under an Islamic attack. Delhi: Neighbor Muslim man stabs Hindu woman to spot dead, injured husband & son died later in hospital. Amit Modi | HENB | New Delhi | Jan 18, 2019:: A Hindu woman was killed while her son and husband succumbed to critical stab later in a fight allegedly involving their Muslim neighbor on Wednesday, a police officer said, adding the accused Mohammad Azad was arrested. Police said the incident occurred around 7.30 p.m when some locals informed the local police about a stabbing incident at DDA Colony at west Delhi’s mixed area of Khyala. “The victims were later identified as Sunita (35), her husband, Veeru (41) and their son, Akash(18). They were taken to a nearby hospital with multiple stab injuries. Sunita succumbed to her injuries without responding any treatment. Veeru and Akash were undergoing treatment in critical condition but they also died later,” said Joint Commissioner of Police Madhup Tiwari. Muslim Neighbour attacks a Hindu family with knife in Delhi, kills woman and her husband and son. “On Wednesday, Azad misbehaved with Sunita over the same issue. Sunita later narrated the entire issue with Veeru and Akash following which the fight began,” the officer added. “Azad took out a sharp knife from his residence and first stabbed Akash. When Sunita and Veeru tried to save their son, Azad stabbed them too,” said the JCB. This triple murder case caused Sunita’s two children orphan. They were sent to Homes by the police as reported. Attack upon Hindus or Hindu locality by Muslim neighbor or mob has been increased in recent times in Delhi and surroundings. Source: India TV & Aaj Tak. Explaining Islam is simply – “Infinite filth of existence”. 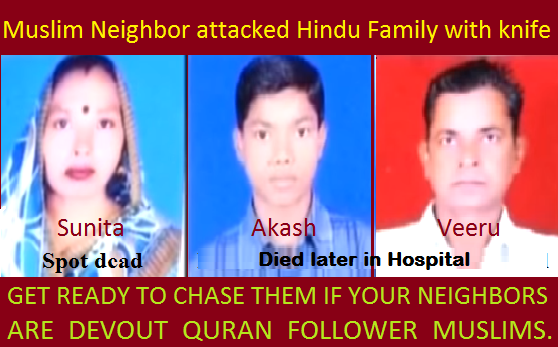 This entry was posted on January 19, 2019 by hinduexistence in Anti Women, Anti-Hindu, Attack upon Hindus by Muslims, Conspiracy against Hindus, Hindu Girls under attack, Hindu Girls victimized by Islamists and tagged Attack upon Hindus in Delhi, Beware of Muslim neighbor, Delhi Triple Murder, Muslim Neighbour attacks a Hindu family with knife, Neighbor Muslim man stabs Hindu woman.